To prop up humanitarian support to the displaced people from Myanmar in Cox's Bazar, Japan has provided an emergency grant-in-aid of $2 million. The aid will be distributed through the International Organization for Migration (IOM), the Office of the United Nations High Commissioner for Refugees (UNHCR) and the United Nations Children’s Fund (UNICEF). An estimated 74,000 people have crossed the border from Myanmar into Cox’s Bazar since October 2016. 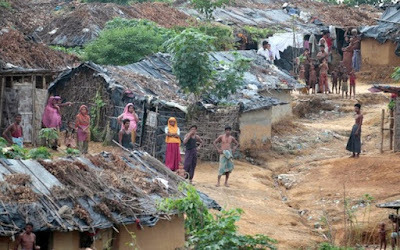 Bangladesh has also sheltered more than 500,000 Rohingya refugees who have crossed the border at different times over the past few decades. The refugees face limited shelter, food, necessary item, health service and poor access to water, sanitation and hygiene. According to a statement, funds from the grant will help UNICEF to provide Maternal Neonatal Child and Adolescent Health (MNCAH) to 61,822 children under the age of five, 58,299 women between 15-49 years of age and 2,000 adolescents in the refugee communities. It will also distribute health information and education services, immunisation, latrines, hygiene and hand washing devices. The UNHCR will distribute non-food items among 2,600 families to help them weather the monsoons. The IOM will attend to the emergency needs of the recently arrived, provide shelter to the homeless, necessities and access to mental health care. “With the increasing influx of DPs in the host communities and the makeshift settlements, the services and resources are falling short, children bearing the biggest brunt,” said UNICEF Bangladesh Representative Edouard Beigbeder. The representative expressed his gratitude for the aid from Japan.